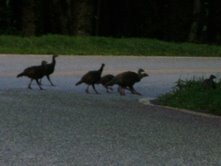 If that last picture is a turkey looking for a place to hide, he picked the wrong crowd to hand with:-) Great pictures! Lynn, I love the one of the turkeys running across the road, in a blur!!! In celebration of upcoming Thanksgiving....!